Practice uphill and downhill corrections. I don’t want to get too into posting other people’s articles. But every now and then I run across an article that is just too good to pass up. 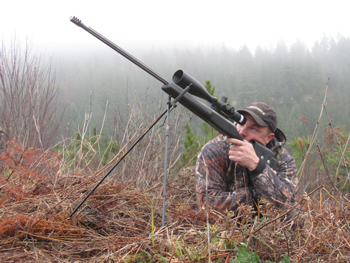 10 Ways To Stronger Rifle Field Shooting Positions is full of information and great advice. Well worth the read. After having spent years in the hunting fields, rifle competitions, and training arenas, I have noted that a high number of missed “field” shots in these conditions were the result of unstable or flat out poor shooting positions. Now, in the areas of hunting, rifle competition, and training, your field shooting position will often be far from ideal. However, there are things you can do to raise your first round hit percentage by improving your shooting position. 1. Get your rifle as close to the ground as possible. The higher your body and your rifle are up in the air, the less stable you typically are. Not all field positions allow you to be right on the dirt, but be there whenever you can. Even if you do not use a bipod on your rifle, simply being prone and unsupported is a better position than sitting, kneeling, or leaning against a tree. The closer you and your rifle are to the dirt, the more stable you will be. Now, getting low may not always be possible, so be prepared for other unique field shooting positions, but try to stay low whenever possible.